It’s been a week and a day living in the boat yard. 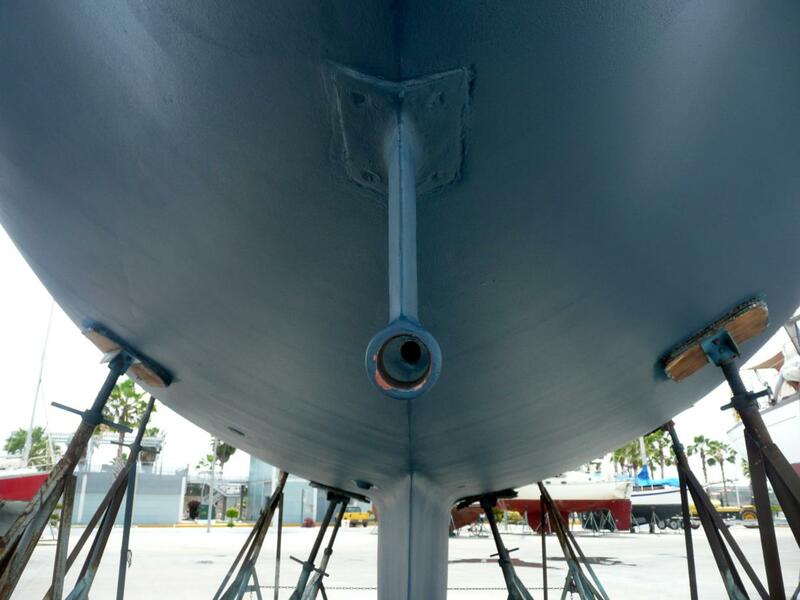 So much for a couple days out of the water for bottom paint. 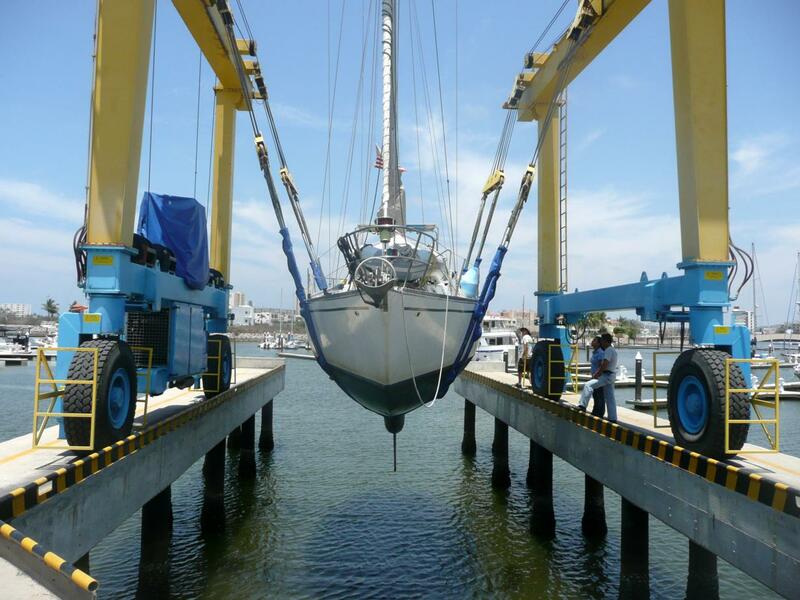 We went ahead and decided to haul out here in Mazatlan after good words about Total Yacht Works. 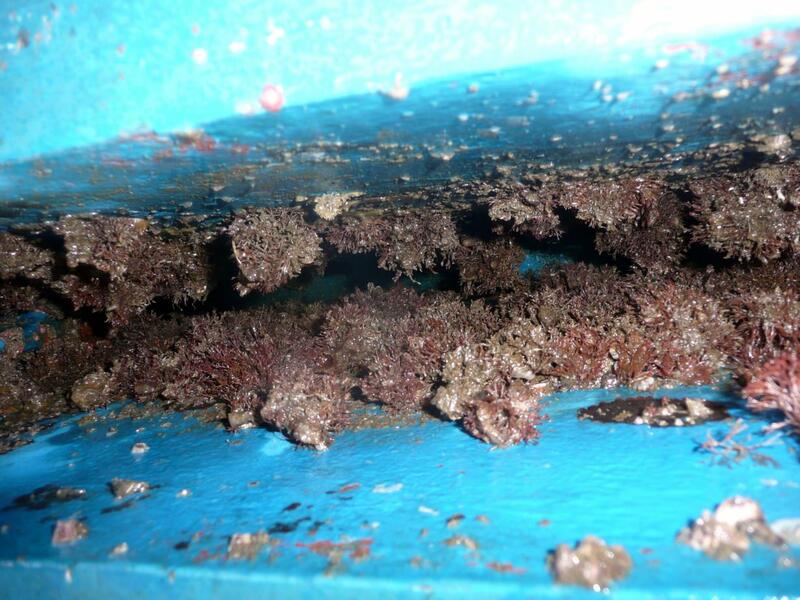 Not only did they have the lowest estimate for painting the bottom of the boat, they had an opening for us in a week, while the other two companies didn’t have an opening for a month. So, it wasn’t a tough choice. We did manage to call some boatyards in La Paz since we are headed there next, but we weren’t getting any better rates and it was difficult to communicate over the phone with our language skills. Honestly, I’m impressed we tried and were able to get the information we did. 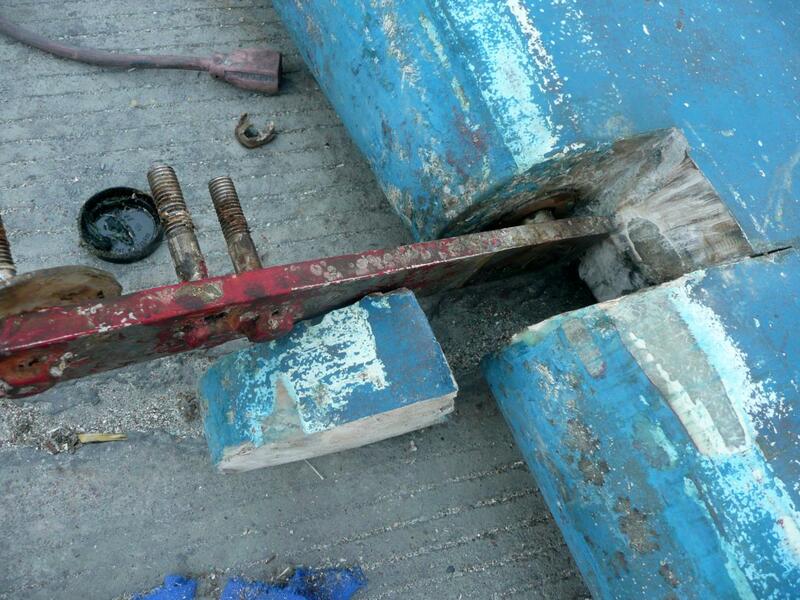 We got off to a bit of a bad start on Monday when we went to the Fonatur boat yard. They handle the haul outs and manage the yard we would be staying in. 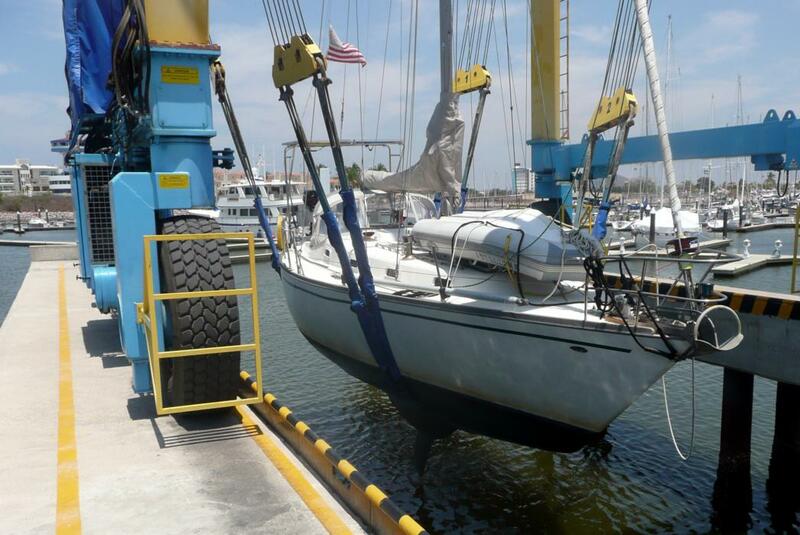 We were scheduled for a 3:00 pm haul out, but when we told them about our appointment (made by Total Yacht Works for us) we found out we had been re-scheduled for Tuesday, but no one had told us. Back to the marina where we had just checked out and pay for another day. We used the rest of Monday to get all of our paperwork taken care of with Fonatur, and try to mentally prepare for the haul out all over again, especially now that we had been told we had to back into the slot where the lift would pick us up. 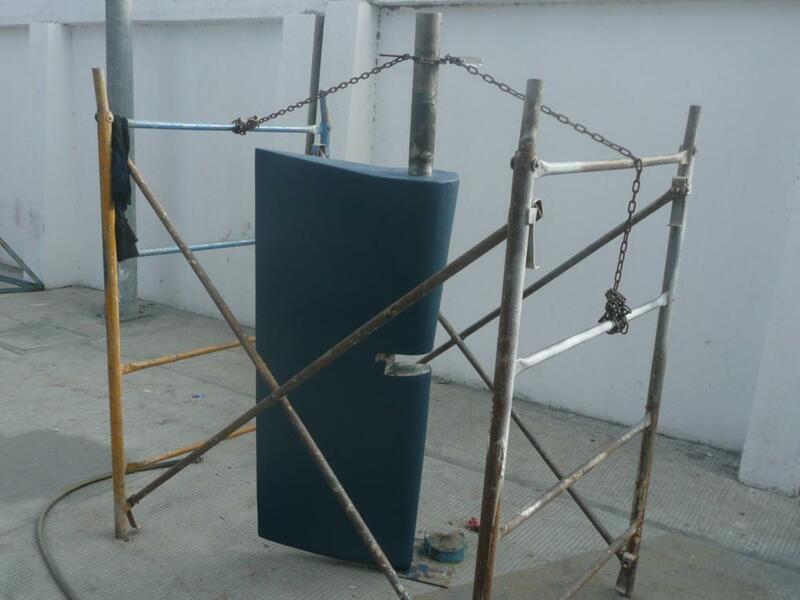 Between my backing skills and Ventured struggling to do anything other than spin in backwards circles to port when it reverses, I was not looking forward to trying to put it between two cement piling about 20 feet apart. I’ve come to the conclusion sailboats are not meant to go backwards and do my best to avoid that direction. Tuesday was our big day, so we steeled ourselves and headed for the boat yard. Just as we were pulling out of the marina slip, Bob from Total Yacht Works came by in a dinghy, and told us that at 37′, we could go into the sling forward. There was palpable relief on both our parts, the only person more nervous than me when I try to back up the boat is Jenn. Our entry into the haul out slip was described by Bob as “I’ve seen better, and I’ve seen much worse.” It would have been pretty uneventful but we had a bit of a problem getting the first line tossed to one of the workers on the dock and with a bit of wind picking up, by the time we did get lines to the handlers, we weren’t quite straight in the slip anymore. 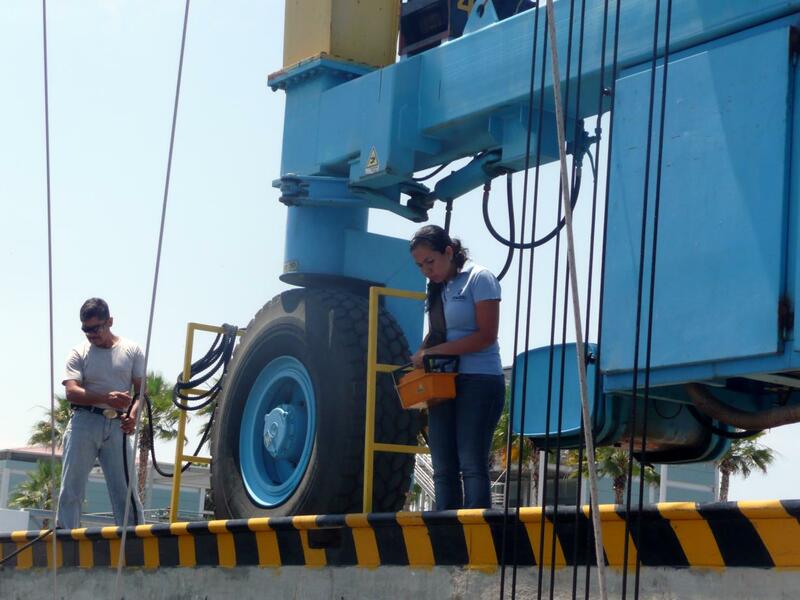 Once the lines were secured, the slings were positioned, the engine in the lift went to work, and we rose up. And settled back down for some sling repositioning. Then back up again and this time we started to head over dry land. However, our forestay was not going to clear the front of the haul out lift when we were lifted high enough to move over dry land. Given the options of dropping back in and backing into the slip with rising wind, or dropping our forestay, we chose the latter. Note to self -reattach the forestay when we go back in the water! Pulling into the slip for the haul out, thankfully pointy end first. Fonatur employees getting the slings set. There is something about a woman who can drive a haul out lift. 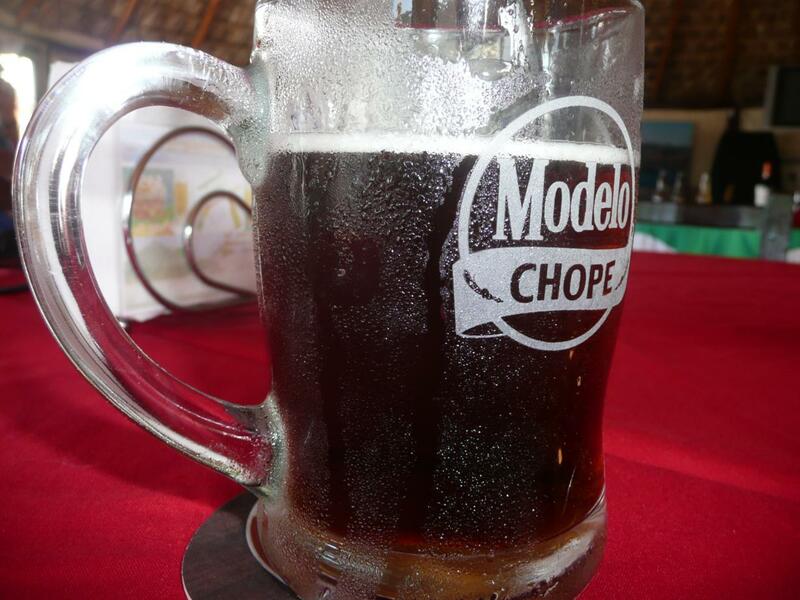 Mazatlan, we have lift off. And of course, the classic haul out shot. Once we were over land, it didn’t take long for the bottom to get pressure washed and boat set in our new home. I guess this counts as our first nights on land since last September, even if we are still in the boat. Staying on the boat while over pavement presents some challenges. While we can dribble some water out a sink drain if need be, we can’t use the head (toilet for you non-boaters) and we purposely ran the water tanks low to reduce the weight of the boat while sitting on stands. So of course our tanks ran dry a couple days into our stay. Every morning we head to the marina bathrooms to do dishes and fill a pitcher and our Nalgene bottles with water, and the only thing worse than waking up at 3:00 am with a full bladder is having Minion jump off his shelf and landing on your full bladder. 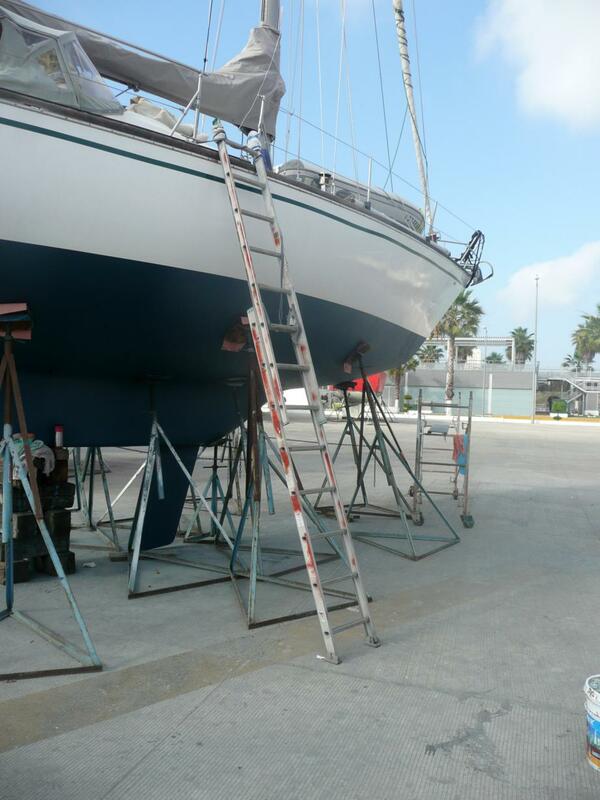 Getting on and off the boat requires going up and down a 15 foot high ladder, and carrying bags of dishes only makes that more exciting. 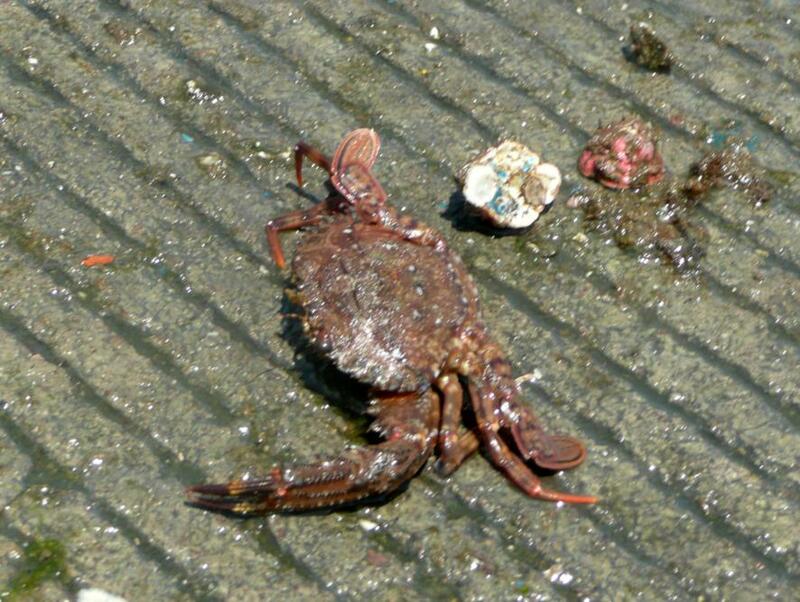 I’m rather embarrassed to say I think this washed out of the centerboard trunk while the hull was being power washed. Our new home away from home, so to speak. I’ve lost count of the trips up and down this ladder. Which for the record is not a good thing. So, why stay for a week for bottom paint you may ask? 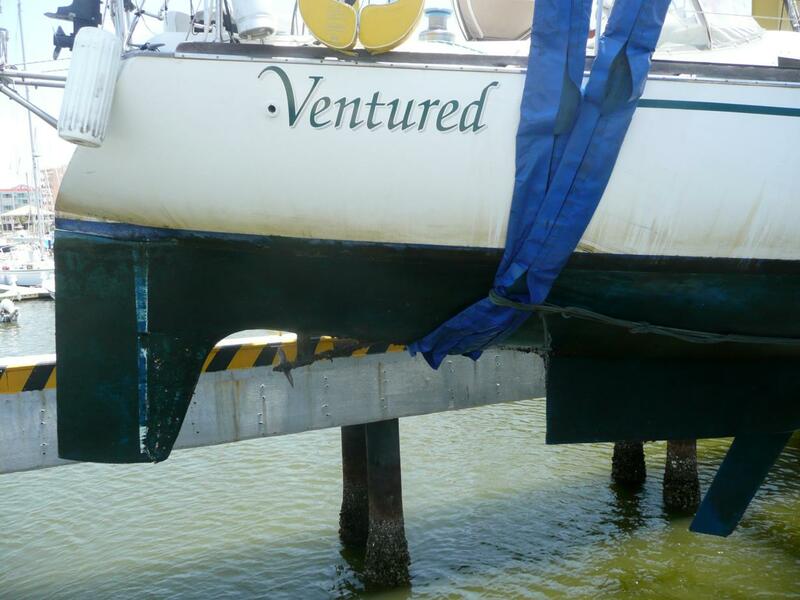 Well… when we came out, Bob pointed out a bit of a wobble in the rudder. 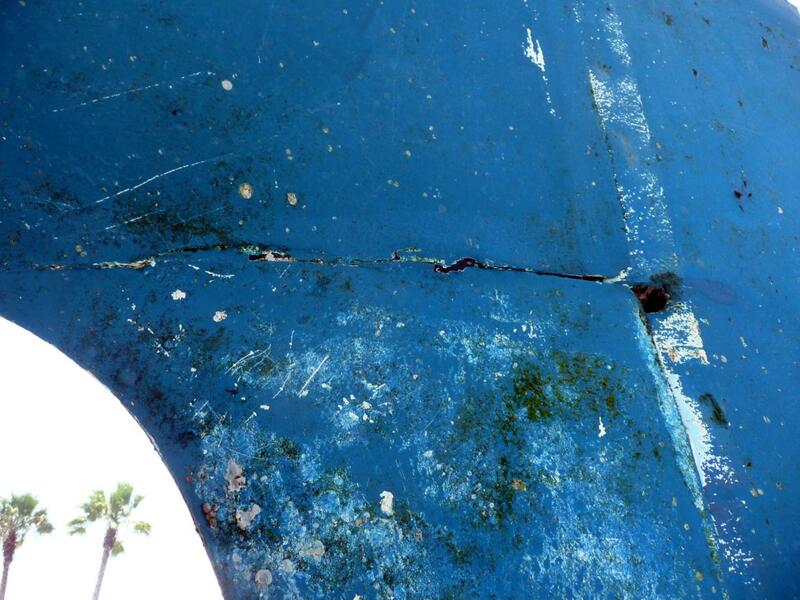 Nothing bad, but the lower shield that sits in front of the bottom half of the rudder had cracks in both sides where it joined the hull, and while Bob wasn’t instant that we fix it now he did recommend that we address the wobble before heading to South Pacific. Even though that isn’t on our list of things to do right now, we decided to get it fixed. Thanks to www.tartan37.com, I found a PDF file with pictures and instructions on how to remove the rudder to forward to Bob, and with those instructions it came off amazingly fast. 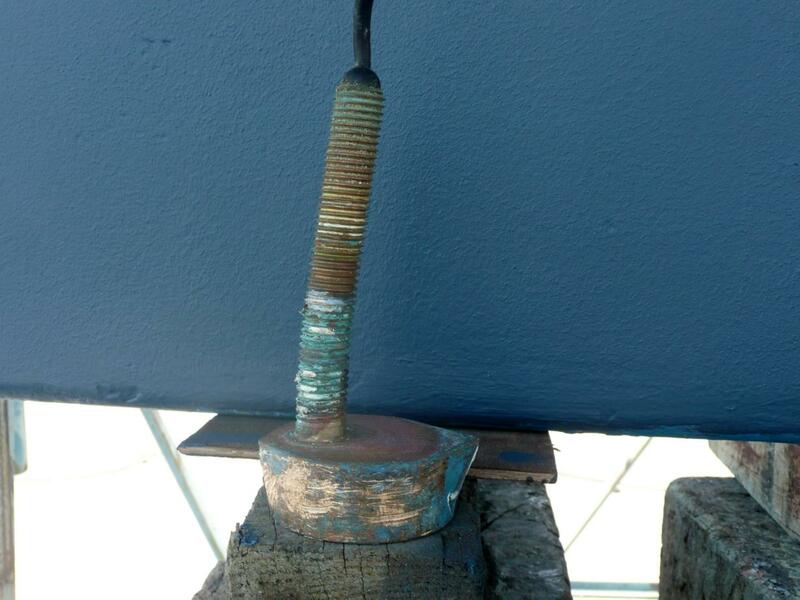 Luckily we made a good decision to fix it, as the lower pin the rudder sits on was detached from the support bracket, and pitted with corrosion. A slightly larger pin has been fabricated and attached to the bracket, and the rudder is almost back together and ready to reinstall. A sign something is a tad amiss with the rudder. So off comes the rudder, steering is over rated. 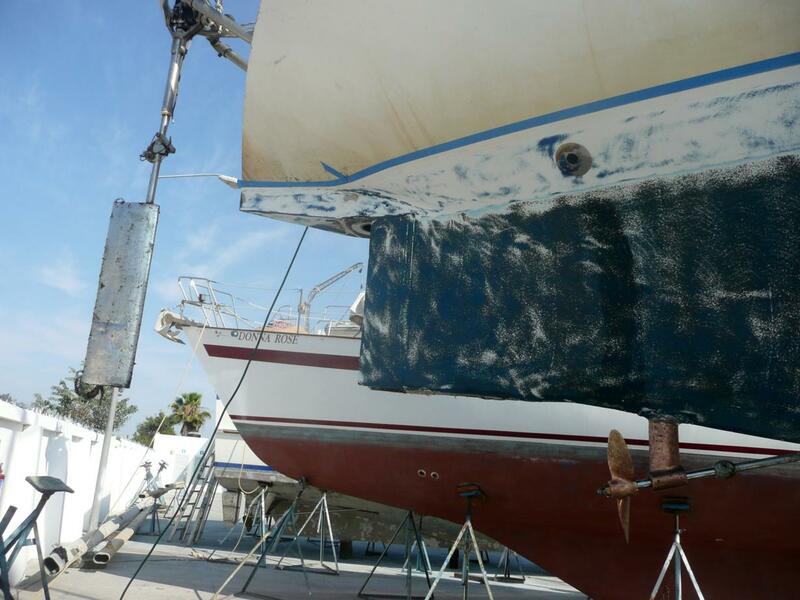 The white stripe on the hull is the concession many cruising boats make, we are raising the waterline. 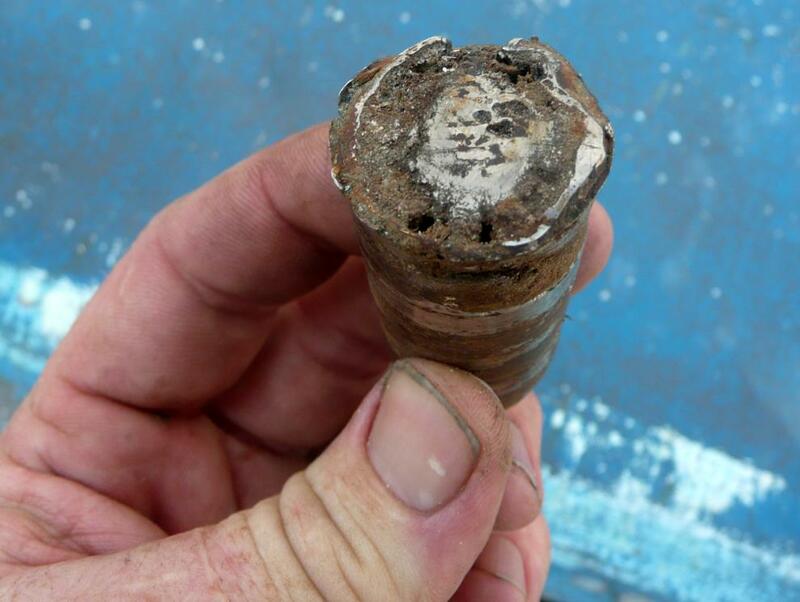 The old rudder pin. I think choosing to get it replaced was probably a good call, although we couldn’t see how bad it was without making the decision to have the work done. New pin welded to the support strut. The rounded chunk is part of a rather interesting design, it has to be sawed out to remove the rudder shaft and then glued back in. 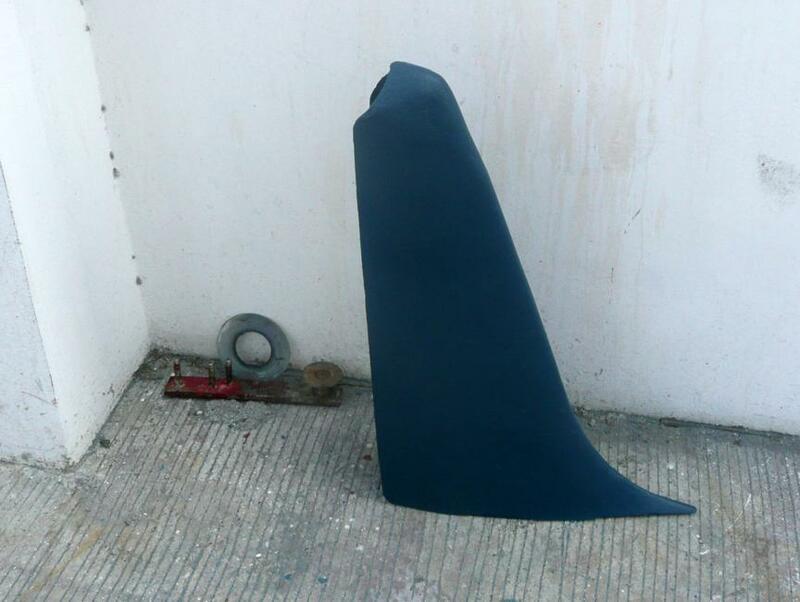 Another piece that comes off during the rudder removal, all painted and ready to be installed to improve water flow over the lower half of the rudder. And almost all back together, should be going back on the boat today. There were two other projects I wanted to accomplish while out of the water. 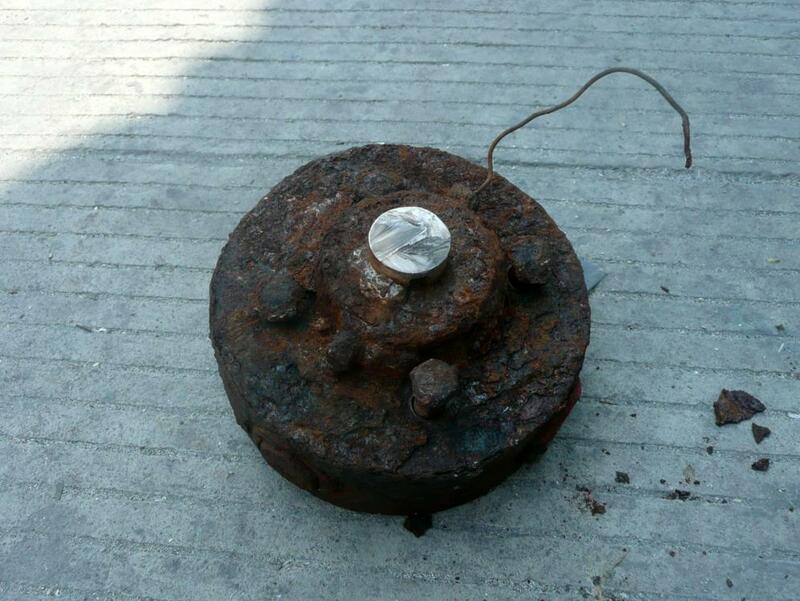 One went quite quick and easy – installing a new transducer that will plug into our GPS and give us a more accurate picture of the bottom and our current depth only readout. There happened to be an old, non-functioning transducer right about where the new one needed to go, so Jenn and I removed it, and had Total Yacht Works put in the new one. They did have to cut a larger hole, and I’m happy to find our hull near the keel is over an inch thick of solid fiberglass. They just don’t build them like they used to! Now I get the fun part -running the wire from near the front of the boat to under the cockpit and up through the floor to the GPS. 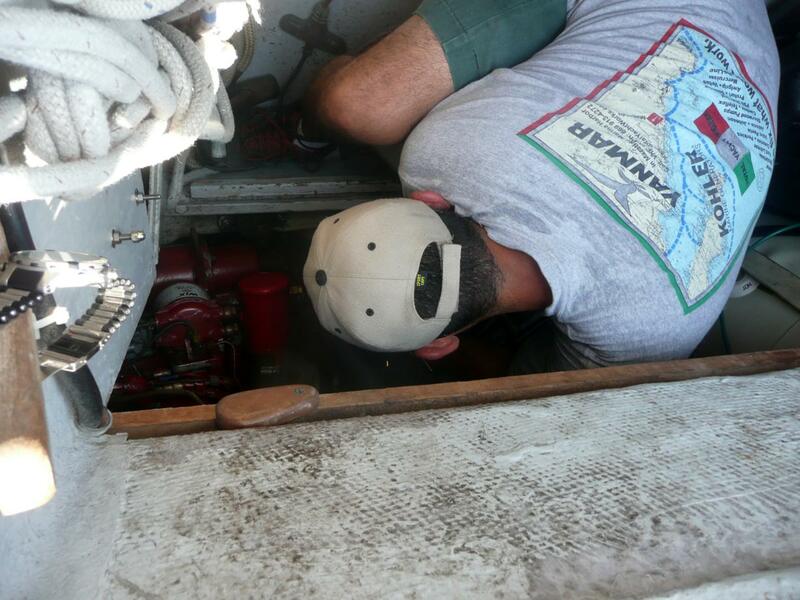 I just love running wires through the bilge, it is almost as fun as dealing with government officials. Nothing like a hole below the waterline to keep you on the hard. Out with the old. I really hope I tracked the wiring right and this was not the transducer hooked up to our working depth sounder. Minion inspects the project progress. And in with the new. Can’t wait for our new broadband view of the bottom! I don’t know about you, but all this work is making me thirsty! And finally, we needed to put new shaft packing in the stuffing box (if you are a non boater, this is not nearly as naughty as it sounds). 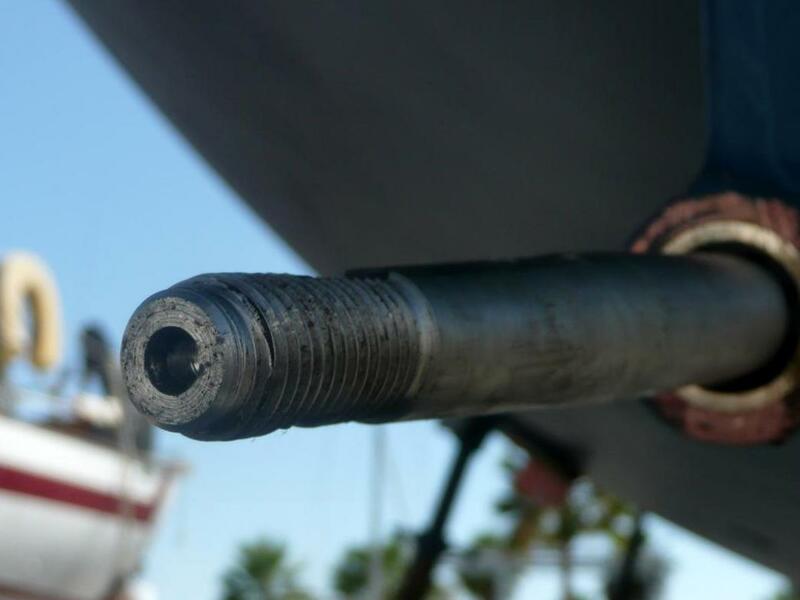 The stuffing box should not drip while the engine is off, and have a few drips per minute while the propeller shaft is turning. Ours dripped constantly while the engine was off, and trickled while motoring. There are two nuts to adjust that tighten the stuffing box packing around the shaft (yes, I know this is sounding worse and worse) but they were frozen together and I exhausted the amount I could tighten them to prevent leaking. We are not allowed to work on the outside of the boat in this yard (although no one has stopped me from hand waxing the hull despite my hope they would). Since all the above mentioned parts are inside the boat, I thought I would tackle this project. But with the two nuts frozen together I couldn’t undo everything to access the stuffing box. 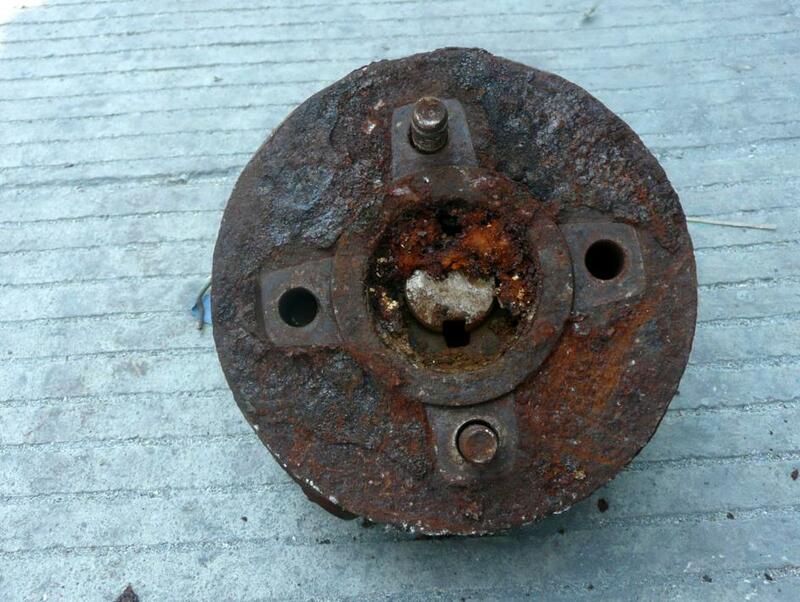 I invited Bob aboard to consult, and after looking at the large chunk of rusted metal that connected our transmission to the prop shaft, he informed me “it doesn’t look good.” Admittedly, the coupler had given me pause for thought when I bought the boat, I wasn’t thrilled with the condition of it. But it was such a huge chunk of metal even if there was some rust on it there was quite a bit of metal still to go. 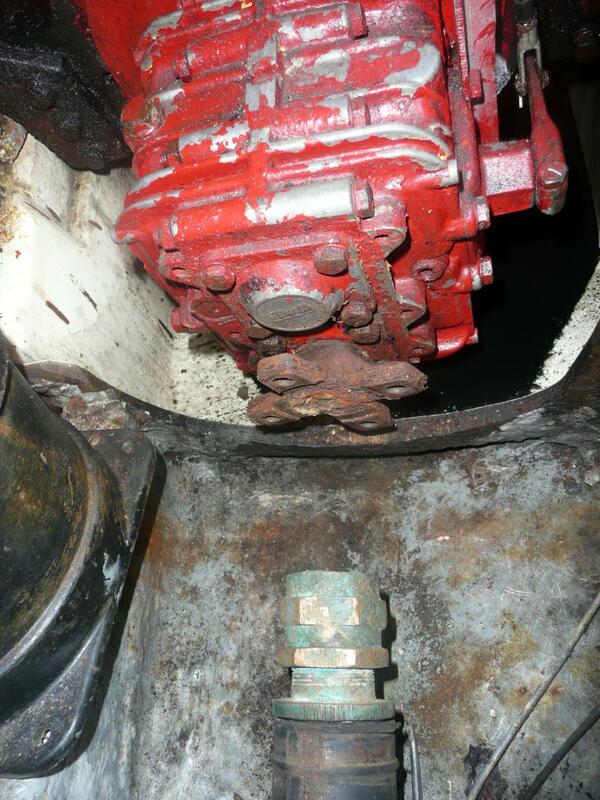 Bob let us know that most likely we would have to cut the prop shaft off, build a new one and install a new coupler. On the plus side, the rudder would have to be removed to pull and reinstall the prop shaft, and our rudder was already off. So… we asked for a summary of our bill so far, and an estimate for the shaft work while I went online to double check my bank balance. I also tried without success to remove the coupler. I did get out four bolts and removed a lot of rust. You haul out for bottom paint and just never know what you’ll find. I will say this – I love my boat, but if I’m ever shopping again I’m bringing a buyers surveyor. But really, for a boat almost as old as I am I think it is in good shape and these are moving parts that wear out. The items we are replacing are likely the original parts and the fact they held up this long shows the quality that originally went into the boat. The next morning we found out our current tab was less than expected and the quote for the additional work seemed reasonable. 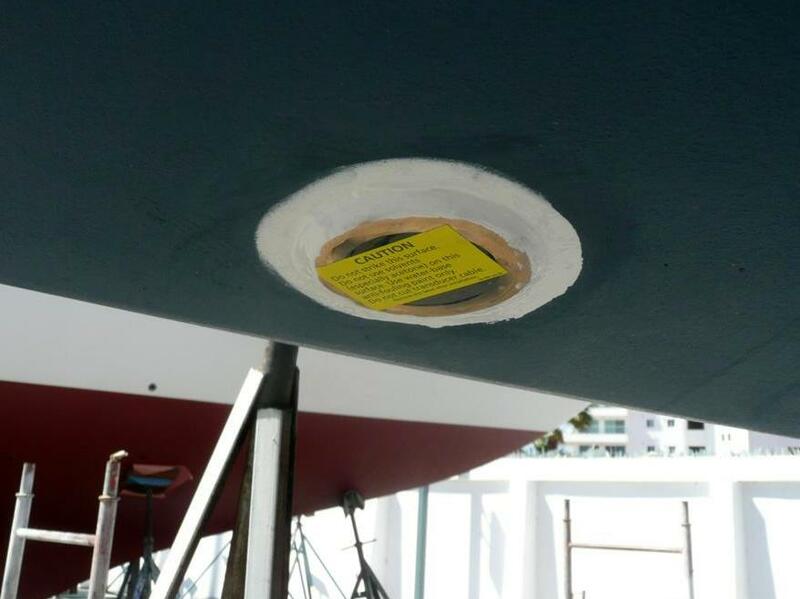 We didn’t really want to go back in the water with our leaky stuffing box, so we gave the OK for the extra work. Once everything came apart it turned out we needed a new cutlass bearing, which I had kind of suspected before the haul out. Again, an item that wears out over time. I’ll feel a lot better about being in remote areas this summer with all this work done. Getting the shaft cut out. 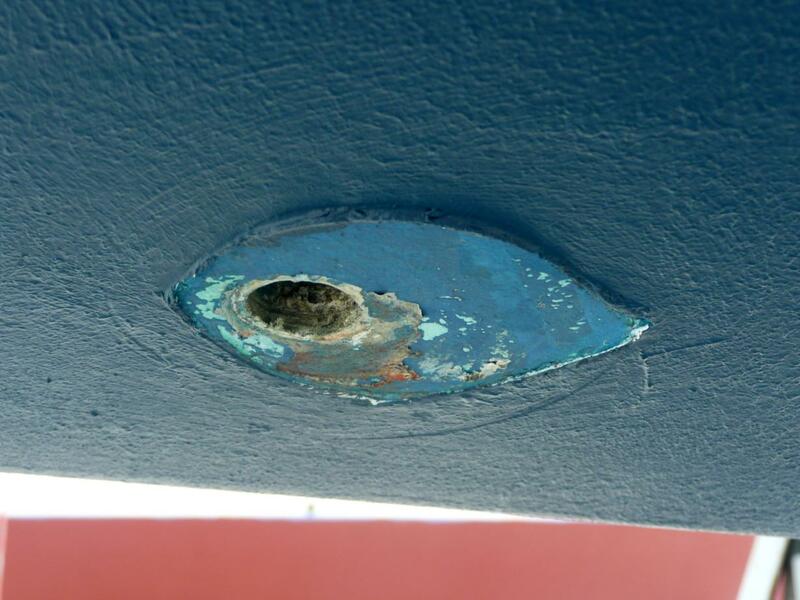 And yet anther hole in the bottom of the boat. 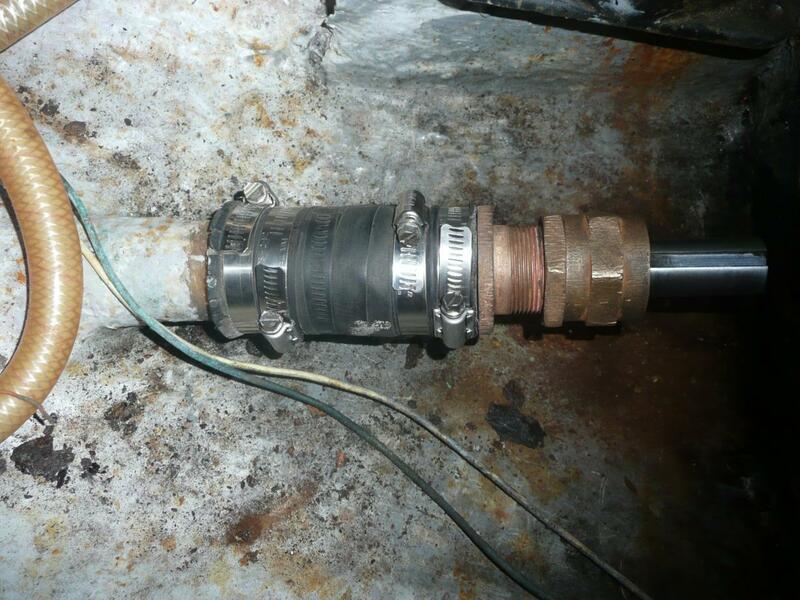 Our old coupler from the transmission to the prop shaft (the cut silver circle in the middle). And the other side, not so hard to see why this was not coming off without a grinder being involved. Looking much better with the new stuffing box, the nuts aren’t frozen together and that is always a good thing. And looking better from the outside, new cutlass bearing and prop shaft (sans prop at the moment). I guess it doesn’t matter that we can’t steer, because we can’t motor without a prop shaft. The one struggle I’m having (beside the knowledge I’m going to get a bill about twice as big as our initial budget for bottom paint) is that I’m paying someone else to work on the boat, when I’m trying to be an independent cruiser. Even if I had pulled everything apart, I would still have had to hire some fabrication. Even if you turned me lose in a shop full of metal fabrication tools, I couldn’t build a new prop shaft. I’m sure we could have tracked down a place to build one for us, but at what point is that time and energy greater than hiring someone who knows what they are doing, and has a metal fabricator at their disposal? And as mentioned, this yard doesn’t allow us to work on our boats, and we would have had to either head for a yard that did allow us to work on the boat or wait till the end of summer when we should be near one if we make the classic Sea of Cortez loop and head towards San Carlos in late summer. I’m watching the work and learning as much as I can, and hoping next time I can do more of the work. Maybe it is just challenging my manliness not to do my own work, but I shouldn’t feel to bad since with Jenn’s help (and maybe a friend or two back home) I prepped the boat for cruising without hiring anyone. And while none of them have been big jobs, I have used the time in the boatyard to get a few little projects done. Our solar charge controller had quit displaying incoming voltage (while still, more importantly, charging), and I managed to reset it and get the display working again. And with the challenging task of swapping a wire from one post to another on the battery monitor shunt, our incoming solar voltage is now showing on the battery monitor. I’ve even done the typical boat project that is halfway done by mounting the foot pump so we can pump salt water into the sink for doing dishes when we are in clean anchorages. I still need to add the plumbing end but I’m minus a part I need. 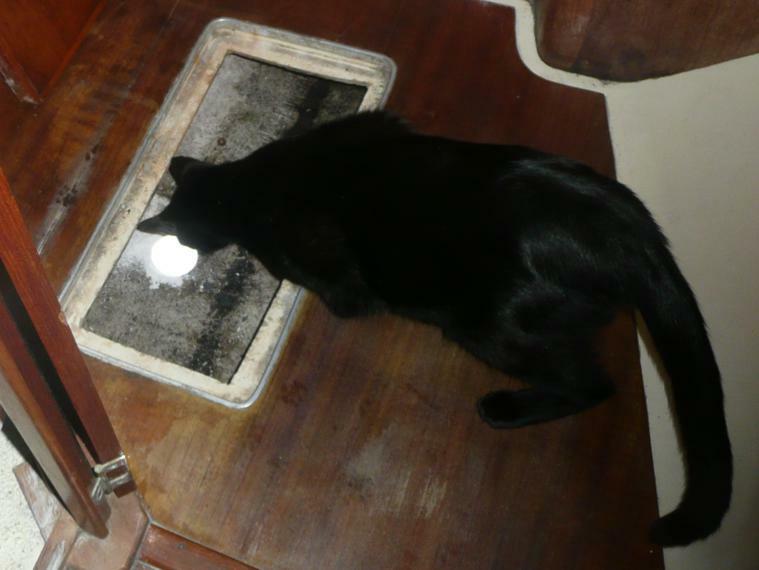 And as I mentioned I managed to hand wax the whole hull – that will cure your desire for a bigger boat! I’ve spent quite a bit of time working on the compass, but it still has a small air bubble and no light for night sailing. Sigh… Jenn sewed up bug nets for both our hatches so we can have air flow, sans bitey bugs. We’ve had a bit of fun too, Leif and Jackie from Dodger Too arrived in Mazatlan a couple days ago, and we went and crashed the El Cid pool since they are in the marina there and caught up with them. We also re-visited The Shrimp Factory with them, although Jenn and I ate beef as their carne asada is quite good. I had it in fajita form, my first fajitas in seven months in Mexico! We are plugged into shore power and pulling in free wi-fi with our $30 boaters swap meet bargain antenna so we’ve spent way too much time on the internet. Get it while we can, it will be in short supply this summer in the Sea of Cortez. Good thing all the shows we download on the internet go on summer hiatus. 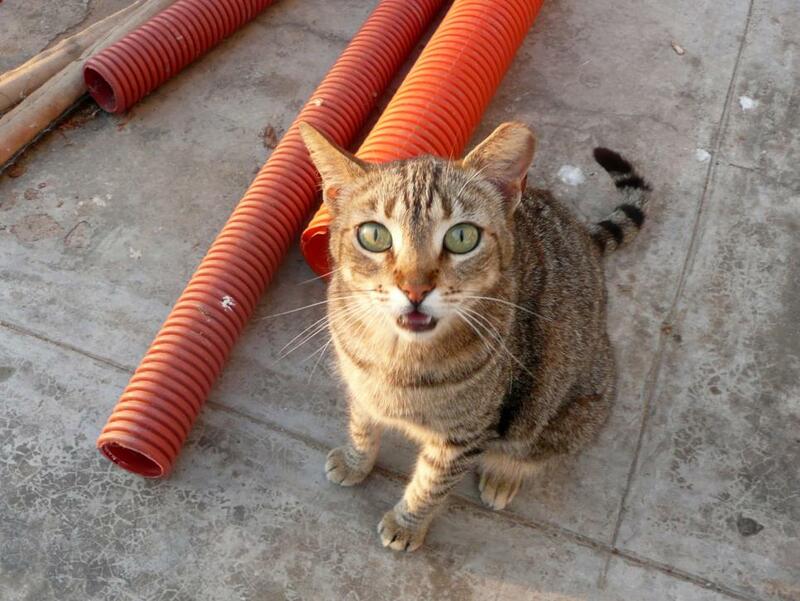 Boat yard life can be stressful, so it is best to stop and pet the kitties. We’ll probably get everything put back together tomorrow, and splash on Thursday. We can’t wait to get back in the water! 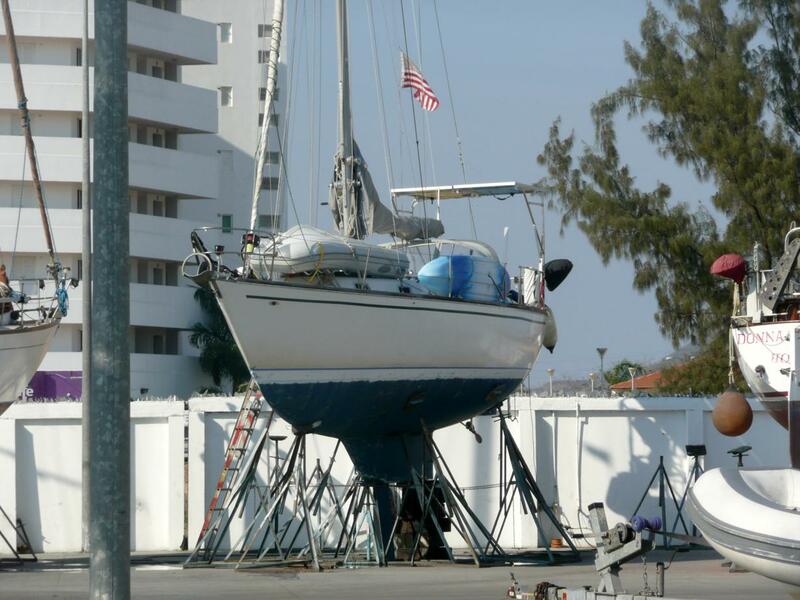 This having the boat sit 15 feet up in the air is no fun. When I’m standing on the deck I’m looking down 20 feet to the ground when I’m used to looking 9 feet down to much more inviting water. While the boat yard is cement, it is dusty, and very hot. And as mentioned before, dishes, water usage and bathroom needs are all very inconvenient. Not to mention we have everything pulled out of the lazerette for access to rudder bolts and prop shaft so there are items stacked all over the cockpit that are normally stowed away. And while we love the little grocery store that is just a short walk from the boat yard, we have just not caught the Mazatlan bug and are eager to move on. Once we are back in the water, we’ll wait a day or two to make sure we aren’t leaking from any of the three holes we opened up below the water line that should all be sealed back up, then hope for good weather so we can head to La Paz. Here we are, back in Bahia de los Muertos. For today, I’m sticking with the old name, Bay of the Dead, not the new one, Bahia de los Suenos, Bay of Dreams. My dream for today is dead, sailing to Mazatlan. After listening to the radio net yesterday morning in La Paz, where the cruisers club web master announced over the net he was resigning because of someone in the clubs “dictatorial attitude,” and another woman calling in with a boat name announcing Christmas caroling at her house, we just kind of spontaneously decided to pull up the hook and go. Not that I’m being a grinch with the Christmas caroling, but you aren’t a cruiser if you own a house in the city you cruised to. You are a resident with a boat. We really enjoyed La Paz, and will be back next spring for a jumping off point to the north end of the Sea of Cortez, but it was time to go before we ended up stuck there. There are some wonderful resources for cruisers, but the community feels stagnant after staying for a few weeks (and by community, I mean the “cruisers” who haven’t left the dock or pulled anchor in months, if not years, not the great people we hung out with!). Plus we perceived a break in the northerly winds that had been pinning us down. So around 4:00 pm, we just pulled up the anchor and started toward our journey to Mazatlan. So far, it hasn’t been our best trip. No major problems, but about two hours into the trip, Jenn’s attempt to boil water resulted in the surprise discovery we are out of propane. I say surprise, as we had sent the tank out to be filled just a few weeks ago, and have had the tank last well over a month with prior fills. I’m not sure if it wasn’t topped off, or there is something to the snipet floating around in my head that the gas here is something other than propane and not as efficient. After some digging, I found the adapter to run our stove off of a 1 pound tank for the BBQ (in the first compartment I looked in, just at the bottom of it). Of which of course we have one almost empty tank, and one full one. Hopefully they will last a couple days. 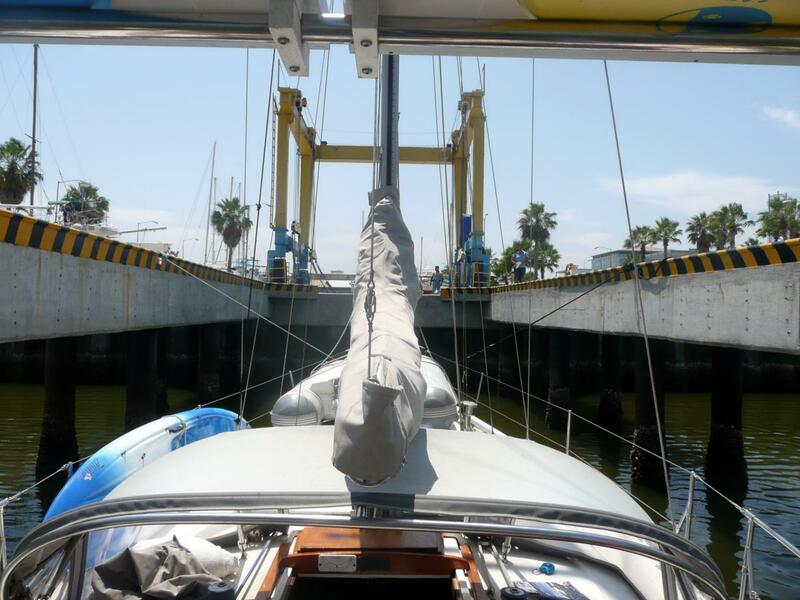 After some light wind sailing, with a couple hours of motoring when there just wasn’t any wind, we exited a channel around daylight, and made our decision to set sail straight across the Sea of Cortez for Mazatlan. Then the wind and sea state began to vary from the forecast. The admiral made another decision, and we turned around and actually had wonderful sailing conditions back to the Muertos anchorage, maintaining 5 plus knots with bursts in the 6 knot range with most of the jib rolled in to keep us a bit more upright. Minion had a bit to say about being under sail again, but other than talking quite a bit doesn’t seem phased to be underway, as usual. He is just a born sailor. While anchored, he amuses himself, and us, by chasing flies. We purchased some netting in La Paz, and the next time we tie up to dock and have shore power the sewing machine is making an appearance to sew some covers for the hatches and companionway. I’m sure we’ll all miss the fly chasing antics, but not the flies. We are now anchored, and getting weak internet but enough to check weather and hopefully upload this post. We think we can manage to try and cross again tomorrow, so hopefully we’ll have a bit better luck then. It is about 190 miles to Mazatlan, in pretty much a straight shot. If the forecast holds and the seas don’t beat us up too much we should be able to make it in a day and half. Sadly we’ll miss catching up with the Jen who crewed the Haha with us, who is leaving Mazatlan today. We had planned to visit her their, but the wind just didn’t work with us. If you were following the Spot, I think the batteries died, so we’ll look for another set before we head to Mazatlan. After an overnight sail, it is time for some naps!